Royal Slab Saw arbor bearing help. The arbor bearings are shot on my Royal / Jenkins 18" slab saw. I was hoping for a tip on how to get the bearings and shaft out of the housing for replacement. Not even sure if this can be done without special tools. If not, do you think 2 pillow bearings without a housing will work? They will need to be pressed out, get the number stamped into the bearing and go to your local bearing supply shop, buy 2. see if you can get the bearings with inbuilt seals. Find a local small engineering workshop and get them to press the shaft and bearings out and press the new ones in, simple job and only a minutes work so shouldn't cost much. Anywhere that does engineering work will have a press even small auto garages. Don't be tempted to belt it with a hammer, serious damage to the shaft could happen. Even if you buy pillow blocks you are still going to have to get the shaft out of the old bearings which is half way there. Thanks for the info. I have been tempted. I'll search around town. Paul offered great information. In case you have have difficulty in locating a machine shop CigarBoxRock does this short of work. Thanks. May take you up on that. We'll see what I find tomorrow around town. Yep, very important to have it pressed out carefully. The arbor housing is pretty delicate and if removed improperly there won't be a tight fit with the new bearings. The number should be visible now, take it in to a bearing house first and tell them what you want, many can install them on the spot. When ordering ask for the same sized bearings but double shielded, open bearings like the pic shows aren't what you want for a saw arbor. Rockoonz, or anyone, is your preference shielded bearings over rubber sealed, if so why? I've always used 2RS sealed, feel they keep moisture out better. Open to opinion. I usually get double shielded for saws because saw oil will swell rubber seals a lot more than grease, and I don't want to take any chances of rock snot encrusted oil getting into them, slim as that chance probably is. Anything is better than the open bearings shown in the arbor pic above. Pictured bearings likely had fiber covers originally to keep the grease in. Probably if arbor is mounted inside tank there was some type of washer and felt or other slinger type gismo to keep oil away from bearing. Every old saw I have changed bearings on had the side exposed to oil or water bad from infiltration into bearing. 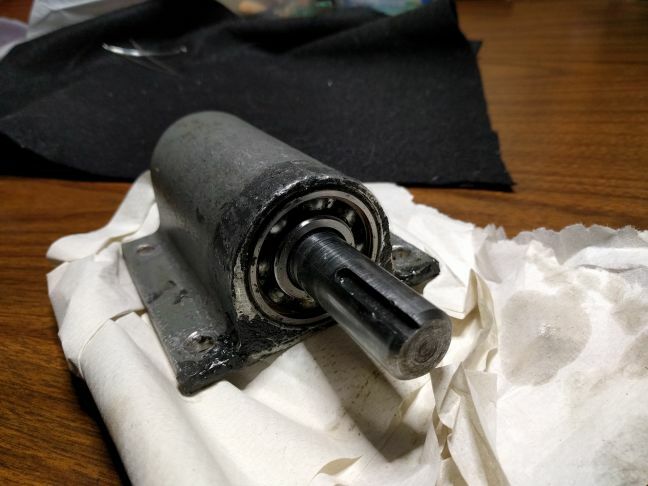 Yes there was some kind of plastic washer covering the bearings. I pried them off to try and find a number on the bearing. No luck. I guess I'll try and find some similar looking 1 3/4" bearings. You need to press the bearings out first. If there is no numbers you can measure the width, height, and outer surface shape (flat or domed). Check shaft surface where bearings ride. If there is any wear, shaft has to be replaced also. I think someone used to advertise Royal parts but can't remember now. Like maybe son of the original manufacturer in the northwest? Thanks John, I'll see what I can find.